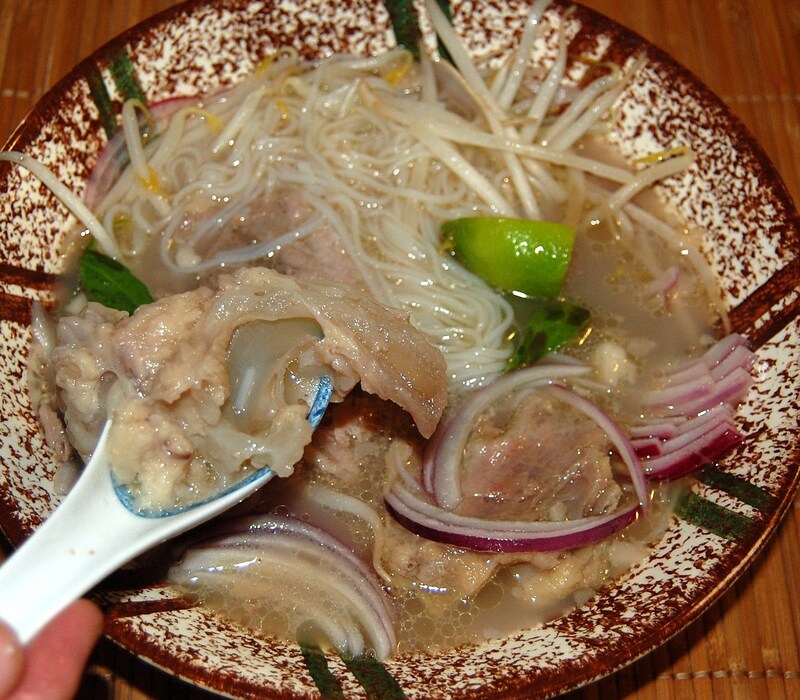 Pho is probably the most popular dish of Vietnam. 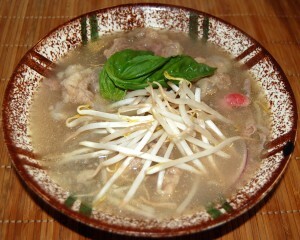 Noodle soups are extremely popular throughout the Far East, but Vietnam is known for its distinctive flavors. 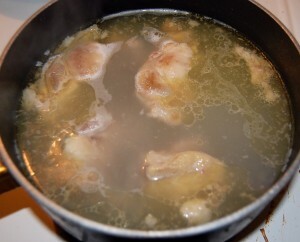 To start, make a beef broth. 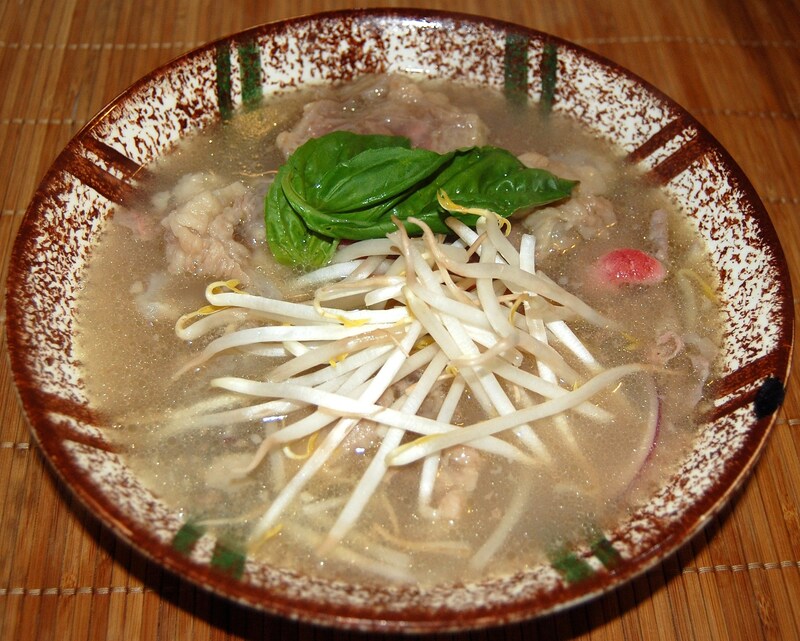 You might want to refer back to this post: Ox Feet Broth, Miso Soup, and Other Soups. 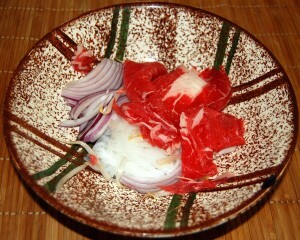 It’s not necessary to start from ox feet, any beef bones will do. It’s nice to choose bones that have a lot of collagen and fat, that makes a richer broth. You’ll also need some rice noodles. 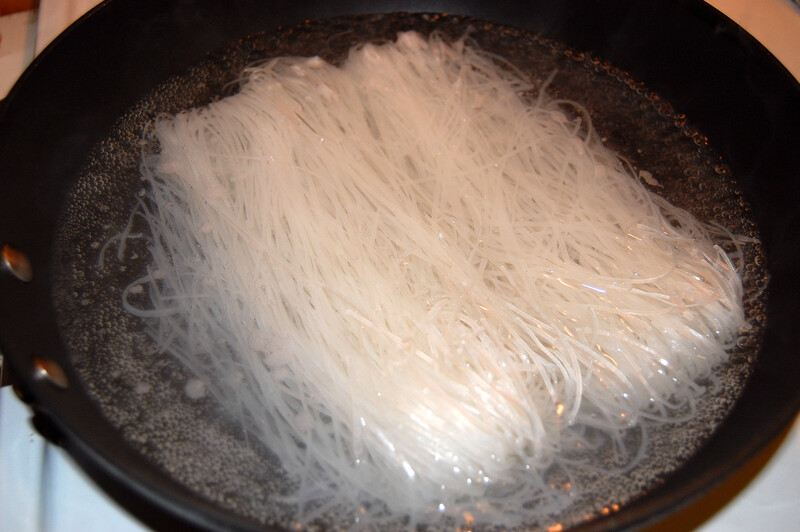 We discussed rice noodles in this post: Cranky Grouch’s Spaghetti. The chief difference from that recipe is that we used thinner noodles, so it took less than 3 minutes to cook the noodles. As before, it’s important to have the water reach a boil before adding the noodles, cook briefly, and then drain the water and cool the noodles in cold water to stop them from cooking further. Another difference is that we didn’t add olive oil at the end. 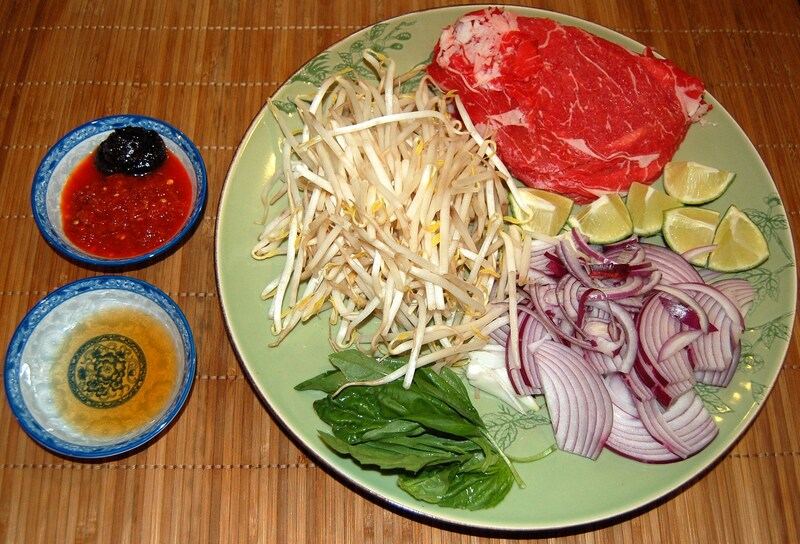 Other standard ingredients are bean sprouts (which are legumes, but low in toxicity and more like a vegetable) and cilantro. We think red onions complement the other flavors. Some spices may also be desired, but are not necessary. Chili sauce for those who like it hot, plum sauce for those who like it sweet. Black bean sauce, garlic, ginger, salt, and pepper are also commonly used. Here is the fish sauce and chili sauce we used. 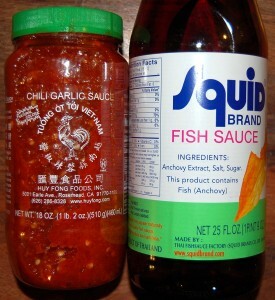 We prefer lighter fish sauces, which are translucent in the bottle; stronger fish sauces are opaque. The lime is cut into eighths, the beef thawed; that is fish sauce on the lower left. It was delicious! The lime and fish sauce flavor is unique to Vietnamese cuisine and makes a great change of pace from our regular cooking. Around the Web; and Is There a Fat Mass Setpoint? CoQ10 and niacin not good for Top Gun pilots: You don’t get useful supplement information like this at other Paleo sites. The case presented here details a Naval Aviator who experienced reduced G tolerance over two successive flights with a temporal relationship of starting a new supplement. Two components of the supplement, coenzyme Q10 and niacin, are highlighted here for their hemodynamic effects. After stopping the supplement the aviator regained his normal G tolerance and had no further issues in flight. Barker PD. Reduced G tolerance associated with supplement use. Aviat Space Environ Med. 2011 Feb;82(2):140-3. http://pmid.us/21329031. Cell phones are not dangerous. N-acetylcysteine and choline reverse insulin resistance in rats. This is for biology junkies. How does physiological insulin resistance get reversed? 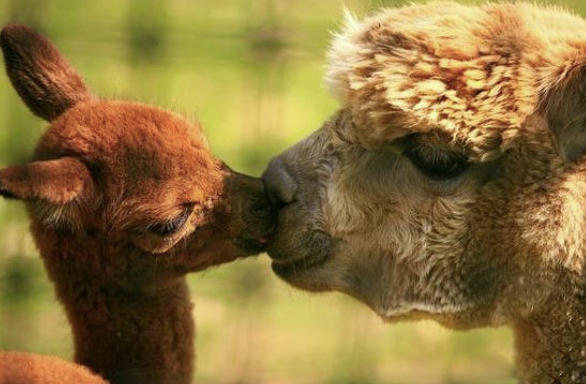 Feeding signals do it, and cysteine and choline may be primary signals. Also, there is liver and brain involvement, since denervation of the liver causes insulin resistance. A hypothesis: there is a “hepatic insulin sensitizing substance” (HISS). Lautt WW et al. Bethanechol and N-acetylcysteine mimic feeding signals and reverse insulin resistance in fasted and sucrose-induced diabetic rats. Can J Physiol Pharmacol. 2011 Feb;89(2):135-42. http://pmid.us/21326345. Joseph Buchignani … discovered that a meat-only diet eliminated his IBS. However, it also caused craving for carbs. Because carbs caused IBS, he couldn’t simply eat carbs. He tried many ways of getting rid of the craving for carbs: eating more animal fat, eating less animal fat, eating oil, eating lard, and eating different kinds of animals and cuts of meat. 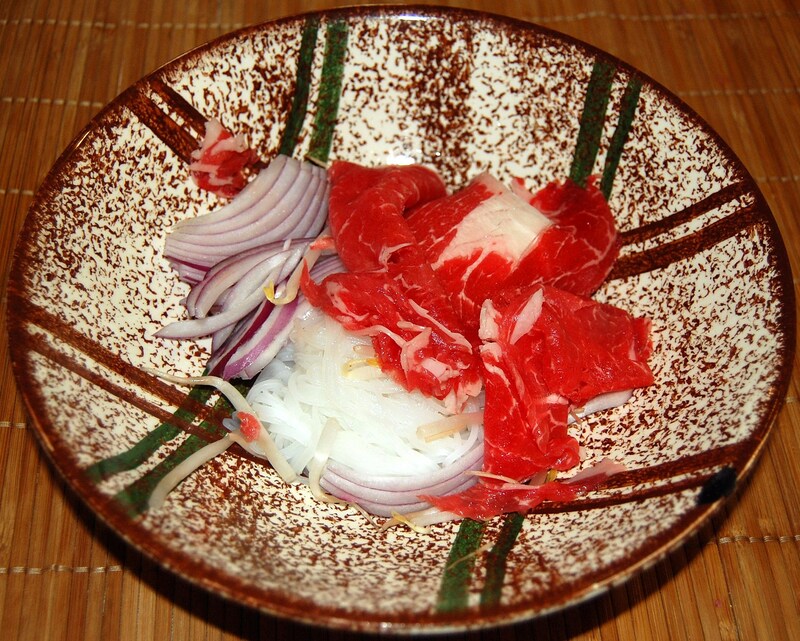 He varied how he cooked the meat, eating especially fresh meat, and eating fresh whole fish. All of these attempts failed. He did not try taking a multivitamin pill. Sure, some cravings reflect nutrient deficiencies. (Not all cravings: An alcoholic craves alcohol.) But in the cases I know about, there is an obvious or semi-obvious connection between the craving and the deficiency. For example, people who chew too much ice (pagophagia) crave ice to chew. They are iron-deficient. Eating iron eliminates the pagophagia. Long ago, a craving to eat something crunchy would have led you to eat bones. Bone marrow is high in iron. So the craving makes sense. In contrast, there is no obvious or semi-obvious connection between carbs and eggs. The explanation for Mr. Buchignani’s experience is not obvious to me either. However, here’s a hypothesis: Eggs are rich in cysteine and choline, so maybe they give an especially strong feeding signal that over-rides the appetite signal generated by carbohydrate deficiency. We need a good mucus barrier to prevent self-digestion. Every once in a while I assert in the comments that we need a good mucus barrier to protect our own cells from digestive enzymes, and so people with bowel problems (hence a deficient mucus barrier) should be cautious about taking protease or lipase enzymes. Then somebody asks for a reference (tough crowd!). Well, here’s a paper that came out this week. It’s about proteases. The new part to me was that NAC is mucolytic and aggravates the injury. So reversing your insulin resistance with NAC might damage your gut … trade-offs, trade-offs. Qin X et al. The Mucus Layer is Critical in Protecting Against Ischemia-Reperfusion-Mediated Gut Injury and in the Restitution of Gut Barrier Function. Shock. 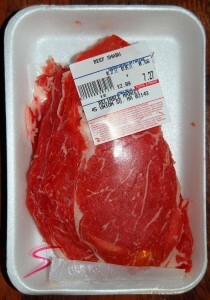 2011 Mar;35(3):275-281. http://pmid.us/20856173. Paleo cavities and chronic infections: Rhodesian Man, dated to between 125,000 and 300,000 BC, had cavities in ten upper teeth and pitting in his skull indicates he was probably killed by a chronic dental or ear infection. Paleo diets were not a cure-all for infectious disease. Via Melissa McEwen. I wanted desperately for it to be right, for my ethics to outweigh my physiology. Then she got death threats. Shows how out of touch I am: If Richard Nikoley hadn’t blogged about it, I wouldn’t have known he has detractors. Whatever for? Has he been teasing the vegans again? Does the body have a fat mass setpoint? Pål Jåbekk of Ramblings of a Carnivore has a discussion of why the word “setpoint” may mislead. I agree – fat mass “equilibrium” or leptin “target” would probably be better words. When it comes to the body fat setpoint, I rather like the lake comparison. A lake can for those less informed seem to have a set point of water level. Despite rather large fluctuations in temperature, evaporation and water going into and out of the lake, the lake maintains it water level because the factors mostly responsible for the level influence each other. This does not mean that it is difficult to change the level, nor does it mean the lake “attempts to defend against change.” Build a damn dam and the water level will go up. Drain it, and the level goes down. It’s not very hard, you just have to push the right buttons. I like this metaphor because it expresses the equilibrium concept – fat mass is in equilibrium the way water in the lake is in equilibrium; the equilibrium can change. On the other hand, the way to adjust water level is to reduce water in and increase water out. Doesn’t this metaphor promote the calories in / calories out view? And isn’t that the view that suggested the failed “starve and do insane amounts of exercise” weight loss regimen? My conclusion: Semantic disagreements can be hard to resolve! (Note to readers: For our thoughts on how to lose weight, peruse the “Weight Loss” category). It’s always a pleasure to hear from readers who report improved health. Some of these emails are poignant: distressing because of the pain of their diseases, yet heartening because of the improvements a good diet brings. It can’t get more poignant than to hear that children with a painful, deadly, and untreatable disease have, thanks to diet, begun smiling, laughing, and getting better. Last week Kindy Flyvholm, who bought our pre-publication e-book, wrote with just such a report. I’m delighted to be able to pass it on, and hopeful that this report will help other children escape unnecessary suffering and enjoy life more abundantly. Thank you, Kindy, for sharing your story! In our book and on this blog, we advise everyone with a neurological or brain disorder to try a ketogenic (“ketone generating”) diet. The book spells out how to tweak the Perfect Health Diet to make it ketogenic: basically, reduce carbs and add copious amounts of coconut oil. Ketogenic diets can be surprisingly helpful with brain and nerve dysfunctions. The reason is that neurons have very limited metabolic options: they can burn only glucose or ketones. Glucose metabolism is complex and prone to failure; ketone metabolism is simple and robust. Especially in disease states, a neuron on glucose can be a totally different creature from a neuron on ketones. Neurological diseases that are disastrous on a glucose-rich diet can become mild when neurons are fed ketones. It doesn’t work for every brain disease, in part because ketones don’t diffuse through the brain all that well. Ketones reach the subcortical and inner cortical layers of the brain easily, but don’t readily reach superficial layers. However, in some diseases the places reached by ketones are the ones in trouble. The evolutionarily oldest parts of the brain, such as the brain stem, are the most likely to benefit from a ketogenic diet. Thus, neurodegenerative diseases that cripple the body may be top candidates for a therapeutic ketogenic diet. One such disease is NBIA, short for Neurodegeneration with Brain Iron Accumulation. NBIA is most commonly caused by a mutation in the gene PANK2, which codes for the mitochondrial enzyme that converts vitamin B5 (pantothenic acid) into CoenzymeA (a crucial metabolic substrate). This version of NBIA is called PKAN, for pantothenate kinase-associated neurodegeneration. NBIA/PKAN is characterized by an accumulation of iron in the basal ganglia of the brain. The iron is readily visible in brain MRIs, producing an “eye of the tiger” brightness pattern. It produces symptoms that overlap with those of Parkinson’s disease. About 1 in 500 people carries a PANK2 mutation, so some form of the disease strikes 1 in 250,000 people. The disease typically first presents itself about age 3, when leg dystonia and spasticity causes an impaired gait, sometimes including toe-walking. The disease progresses and children lose the ability to walk. Dystonia extends to the hands and the face; the head cannot be held upright, and swallowing becomes difficult. Blindness from retinopathy and hearing loss often develop. Premature death occurs usually in the teens, often by age 10 or younger. The last years are excruciatingly painful. You can see his inability to hold his head upright, and the hand position characteristic of dystonia. Zach cannot swallow naturally and has to be tube-fed. The bumps in his chest are from the battery packs used to drive a deep brain stimulation device. The idea is to introduce signals that counter the excruciatingly painful dystonic spasms. Like other therapies for NBIA, deep brain stimulation is often ineffective. In Zach’s case, the device worked for less than one month. It is now turned off but is not removed because the operation would be too traumatic. It was in desperation that we began researching options (ANY OPTION) to prevent the horrible pain that precedes death especially in the case of children with early-onset NBIA. Many research paths led to the ketogenic diet being an option. A lot of discouraging information was presented as well (like how impossible it is to follow or how disruptive it is to family life, etc). It’s remarkable, but doctors are so divorced from dietary science that they do not know how simple and natural a ketogenic diet can be, and assume that only absurdly onerous formulations are needed. As we point out in the book, a large fraction of mammals eat ketogenic diets as their natural diet; and all mammals including humans subsist on ketones during starvation. My son, who is 6, … has been on the diet for less than one month and his hands have relaxed enough for him to regain his pointing ability (which had been lost). Zach, the 12 year old on the diet, is much further progressed in the disease. Zach has been on the diet since late October, 2010, reaching 80% fat levels towards mid-December. The following are the improvements that have been noted by Zach’s family and therapists: Zach has begun holding up his head even though his neck has been hyper extended backwards since he was 9, he has begun pointing with his finger again instead of the palm of his hand, he is moving his right arm again some, and the latest thing is that he is now able to go from a laying position to a sitting position on his own by hanging on to something or someone. He has not done this since he was 9 years old. I know just how they feel! Zach has gotten off all pain medicine and only has a small amount of 3 [anti-spasmodic] medicines left which hopefully he can get off of over the next year. 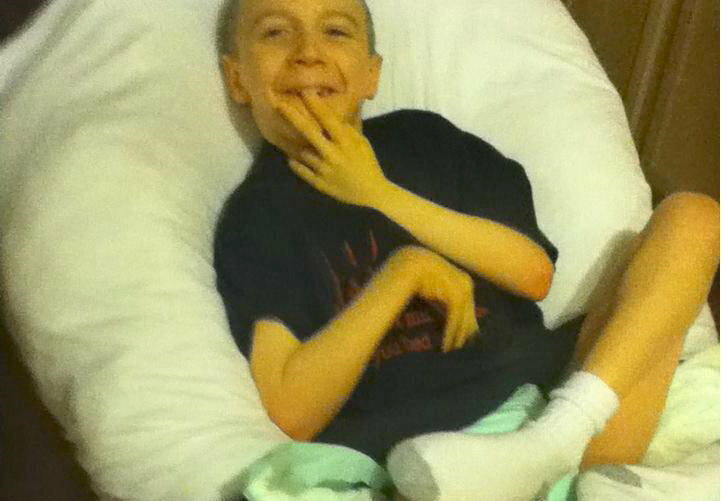 Zach had a recent day where his muscle spasms returned severely. Bad enough he needed to go to the hospital for morphine. At the last minute (before going to the hospital), the parent looked at her recipe for that day and realized she had used a lot of white chicken meat. She added in some more coconut oil into his next few tube feedings and the spasms went away immediately. This is extremely powerful. We are not under any delusions. Our children may be taken from us at any time. If they are taken pain free, then we are blessed compared to the alternative. The situation thus far with our ‘experiment’ has proven much more than we could have hoped. Kindy, it’s wonderful that your research and perseverance has bought hope to your son, and that you’re spreading the word to help others find the same hope. I’m so grateful that you’ve shared your story with us. Hopefully your experiences will reach the NBIA community, save children from unnecessary pain, and maybe extend their lives significantly! We salute every parent who has to deal with neurological and genetic diseases in their children. As this disease illustrates, anyone with a neurological disorder should experiment with a ketogenic diet. Ketogenic diets have been tested in very few diseases, and there is no telling how many neurological diseases may prove amenable to this therapy. But there is already considerable evidence that neurological diseases of the elderly, such as Alzheimer’s and Parkinson’s, are treatable with a ketogenic diet. Last Thursday, I defended the idea of a healthy diet as the best therapy for disease (“Therapy AND Life”). The NBIA kids illustrate just how powerful dietary therapies can be. Medical doctors seem to have great misapprehensions and fear of experimenting with this diet. They do not understand it, don’t know how it should be implemented, and have never tried it themselves. Many of the medical ketogenic diets are malnourishing and generate terrible side effects. Not surprisingly, many patients quit the diets. This coming Thursday, I’ll discuss how to implement a safe, healthy, and pleasurable-to-eat ketogenic diet. There’s no reason for an unpalatable or malnourishing diet to stop patients from enjoying the benefits that Zach has seen! Hawkins RA, Biebuyck JF. Ketone bodies are selectively used by individual brain regions. Science. 1979 Jul 20;205(4403):325-7. http://pmid.us/451608. Gregory AM, Hayflick SJ. Neurodegeneration with brain Iron Accumulation. Orphanet Encyclopedia, September 2004. http://www.orpha.net/data/patho/GB/uk-NBIA.pdf. Klein C et al. Hereditary parkinsonism: Parkinson disease look-alikes–an algorithm for clinicians to “PARK” genes and beyond. Mov Disord. 2009 Oct 30;24(14):2042-58. http://pmid.us/19735092. Paisán-Ruiz C et al. Early-onset L-dopa-responsive parkinsonism with pyramidal signs due to ATP13A2, PLA2G6, FBXO7 and spatacsin mutations. Mov Disord. 2010 Sep 15;25(12):1791-800. http://pmid.us/20669327.